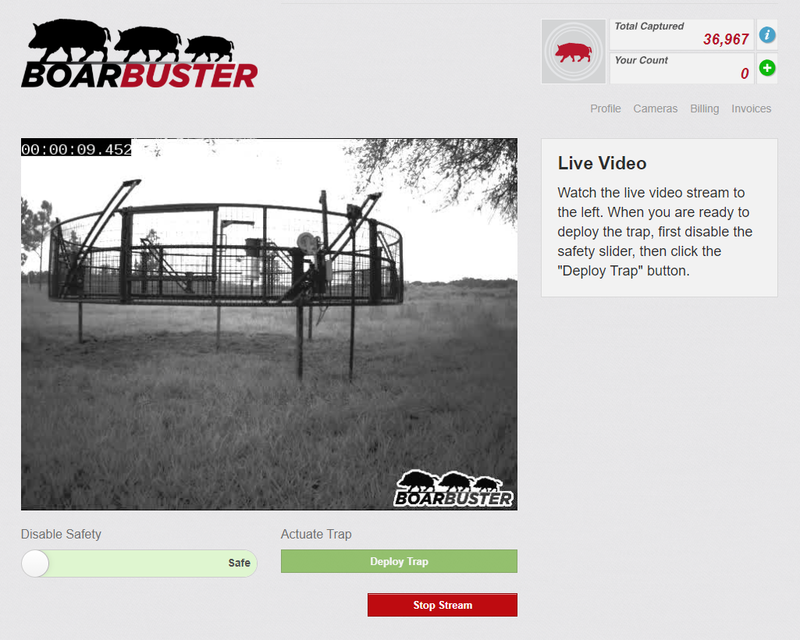 Up-to-date camera and trap information is available by clicking the button from the Cameras page. 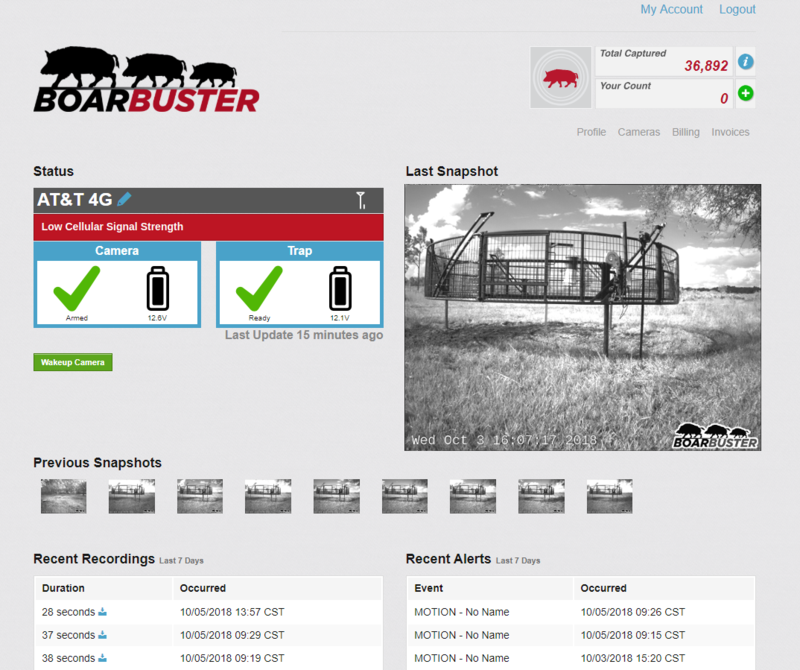 System status, recordings, alerts and streaming are all accessible from the Camera Status page. The last known arming and battery status is always displayed on this page. Arming and battery status is updated upon every successful connection with the camera unit. The symbols and layout are similar what is visible on the camera unit’s LCD screen. An armed camera will provide real-time alerts when motion is detected within viewing distance of the camera. It may be useful to disarm a camera when you are moving the system or not wishing to receive alerts. To disarm the camera, first click on the button and wait for the camera to awake. Afterwards, select to disarm the camera. NOTE: Keeping the camera in an armed state will ensure that your camera and trap system are working together as intended. The BoarBuster hardware is designed to operate effectively using minimal power consumption. By default, the camera unit will enter a low power consumption mode after two minutes of inactivity. Provided the camera is armed, you will continue to receive alerts even when the unit is in this mode. To put the camera into low-power mode, press the button. The battery levels of both camera and trap units are updated once a connection is established. There are low, medium and high battery levels corresponding to specific battery-voltage thresholds. For more information on replacing batteries, consult the hardware documentation. Cellular signal strength of the BoarBuster camera unit is represented with traditional cellphone icons. Signal strength can vary greatly depending upon cellular coverage, foliage density and surrounding structures. Finding the optimal camera and trap placement should take into consideration cellular signal strength. When the camera unit detects two or fewer bars of signal strength, it will warn of low signal strength. To view the live camera stream, it is necessary to perform a camera wakeup by pressing the button. Once awake, press the View Stream button. After a short time, a streaming session will initiate and live video will be present. To deploy the trap, click the safety slider so that it slides to the right. Deploy the trap at any time by pressing Deploy Trap. End the streaming session by pressing Stop Stream. Total Usage is the calculated total minutes streamed across all cameras. Service Period displays the beginning and end of the current service period. In order to provide the best experience for each user, BoarBuster sets a limit on the time spent streaming over the cellular network. When approaching your monthly streaming limit, you will receive a friendly reminder and opportunity to purchase more minutes. Once the monthly streaming limit is reached, streaming will cease and you will be required to purchase more minutes to continue streaming. More minutes can be purchased for a one-time fee. PLEASE NOTE: Minutes purchased do not “roll over.” All minutes expire after the end of the current service period. Once added, your limit will be increased and streaming can continue. 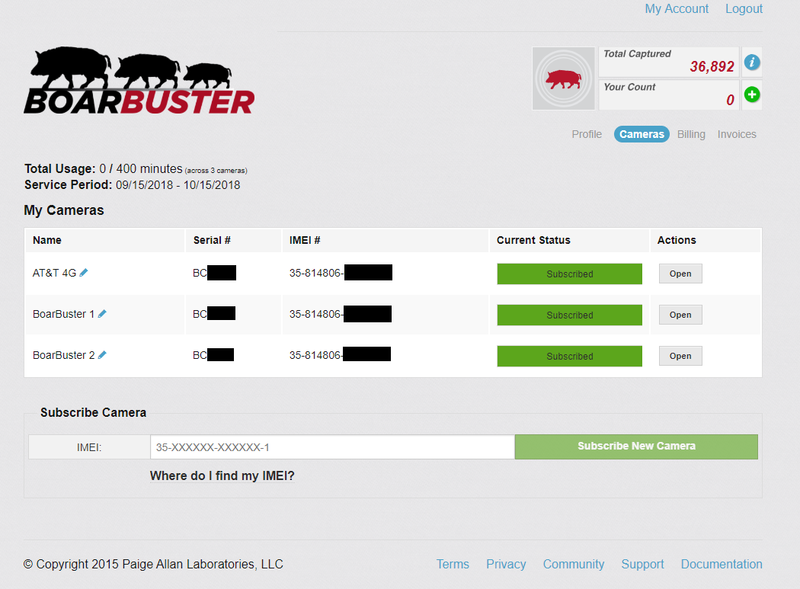 New cameras can be added and subscribed by entering the camera’s IMEI number at the bottom of the page. To read more about the billing process for subscriptions and one-time payments, please read the Subscriptions & Billing documentation.